Combine sugar, milk, Olive Oil, 3 tablespoons juice and eggs in a large bowl. Combine 2 ¼ c flour, baking powder, salt, and baking soda; stirring well with a whisk. Add flour mixture to Olive Oil mixture stirring until smooth. Pour batter into prepared pan. Bake at 350 F for 55 minutes or until golden brown and cake pulls from the edge of the pan. Cool cake upside down on a wire rack and then invert onto a plate. Grease a 9-inch-by-5-inch loaf pan with walnut oil. Combine flour, baking soda, cinnamon, salt, allspice, and cloves and baking soda in a large bowl. Whisk well and set aside. In a separate bowl stir combine the walnut oil, brown sugar, eggs, molasses, and ginger. Whisk well. Add the carrot and zucchini. Add the flour mixture in three parts alternating with the hot water in three additions, beating until flour is just incorporated. Pour into prepared pan and bake until a toothpick inserted in the middle comes out clean, about 45 minutes. Cool cake in pan for 10 minutes and then turn out onto a rack to cool completely. Whisk the powdered sugar with the honey ginger white balsamic and drizzle over the cooled gingerbread. Put oven rack in middle position and preheat oven to 350 º F. Grease springform pan with some oil, then line bottom with a round of parchment paper. Oil parchment. Finely grate enough lemon zest to measure 1 1/2 teaspoon and whisk together with flour. Halve lemon, then squeeze and reserve 1 1/2 tablespoons fresh lemon juice. Beat egg whites (from 4 eggs) with 1/2 teaspoon salt in another large bowl with cleaned beaters at medium-high speed until foamy, then add 1/4 cup sugar a little at a time, beating and continue to beat until egg whites just hold soft peaks, about 3 minutes. Transfer batter to springform pan and gently rap against work surface once or twice to release any air bubbles. Sprinkle top evenly with remaining 1 1/2 tablespoons sugar. Bake until puffed and golden and a wooden pick or skewer inserted in center of cake comes out clean, about 45 minutes. Cool cake in pan on a rack 10 minutes, then run a thin knife around edge of pan and remove side of pan. Cool cake to room temperature, about 1 1/4 hours. Remove bottom of pan and peel off parchment, then transfer cake to a serving plate. One of our employees found this recipe on Pinterest, originally from http://www.bakerbettie.com and modified a few things. Of course we had to add some olive oil to it! This recipe is gluten free and vegan, too! 2. Pulse rolled oats in a food processor or blender until a flour-like consistency. 3. Combine the rest of the ingredients to the blender or mixing bowl, except the chocolate chips. Save one tablespoon of butter EVOO to grease the pan. Blend or mix until consistent and thick. Almond milk or water may be added if the mixture is too dry. The batter should be thick, but not crumbly! 4. Fold chocolate chips into the mixture. 5. Use the remaining tablespoon of butter EVOO to grease a 9×5 pan. Sprinkle rice flour into the pan and shake to coat the pan evenly. Dump out the remaining flour. 6. Pour the batter into the pan and spread evenly. Top with chocolate chips, if desired. 7. Bake for 30 minutes, or until toothpick comes out clean. You can also substitute SOOC Butter EVOO with SOOC Butternut squash seed oil for a richer flavor! Preheat the oven to 350 degrees F (165 degrees C). In a large bowl, cream together the butter EVOO, brown sugar, and white sugar until smooth. Beat in eggs one at a time, then stir in vanilla. Combine the flour, baking soda, and salt; stir into the creamed mixture until just blended. Mix in the quick oats, walnuts, and chocolate chips. Drop by heaping spoonfuls onto ungreased baking sheets. 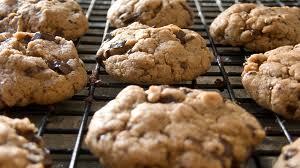 (cookie dough may seem greasy but the cookies will turn out beautiful!). Bake for 10 minutes in the preheated oven. Transfer to a wire rack to cool completely.